I am really curious to know if there is any species of animal more tolerant than a dog. The list of things we put them through and expect of them is forever climbing. Yet they not only put up with it, they come back for more. How many other animals would wait around for us all day, come back when we call them after their first chance to stretch their legs in nine hours, and then lick our faces while we arrange ridiculous costumes on their heads? No matter how you look at it, I am the lucky one in this relationship. My tiny sacrifices of getting up early to walk in the freezing snow or rushing home immediately after work are nothing compared to the sacrifices Shiva makes for me. I’ll never understand it, but I’ll forever be grateful. You nailed it. They put up with so much from us and keep coming back for more. I will certainly never understand it. And like you, am ever grateful for it. Isn’t she though? I knew it was wrong, but I couldn’t resist! She is just so good for taking it! They just want to please us, don’t they? Shiva looks adorable! If I believed in reincarnation I would want to come back as any of my dogs. That would such a great life. I’d hope I wouldn’t have to wear antlers though even though that is unspeakably cute. Kristine this was a exceptional post. You summed up our relationship with dogs beautifully. We do many things for them such as walking and feeding and being accountable for their welfare but all those things ultimately are beneficial to us as well, when we walk or play catch with them we get our exercise, when we feed and rush home to care for them they meet us at the door with a smile and an I thought you would never be back look that makes us feel important. I’m with you I’ll never understand it but I don’t have a day go by that I’m not beyond grateful for it!! Exactly! And they do it all with fairly minimal complaint. With all we expect of them and the little we give, it’s amazing how easily they are able to integrate into our lives. It says a lot about their innate temperaments. We certainly work our hardest to make it difficult for them! 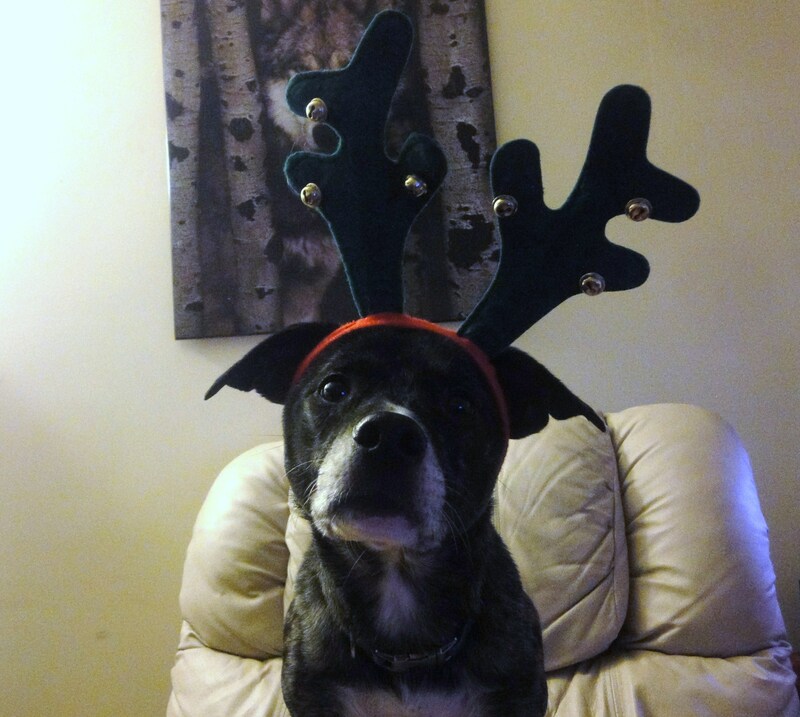 Shiva is the cutest reindeer I have ever seen! We’re definitely lucky they tolerate us and love us like they do. For sure. I don’t know what humans did to deserve them but I am glad. Come on Shiva! Show her what you really think about those ridiculous things on your head! 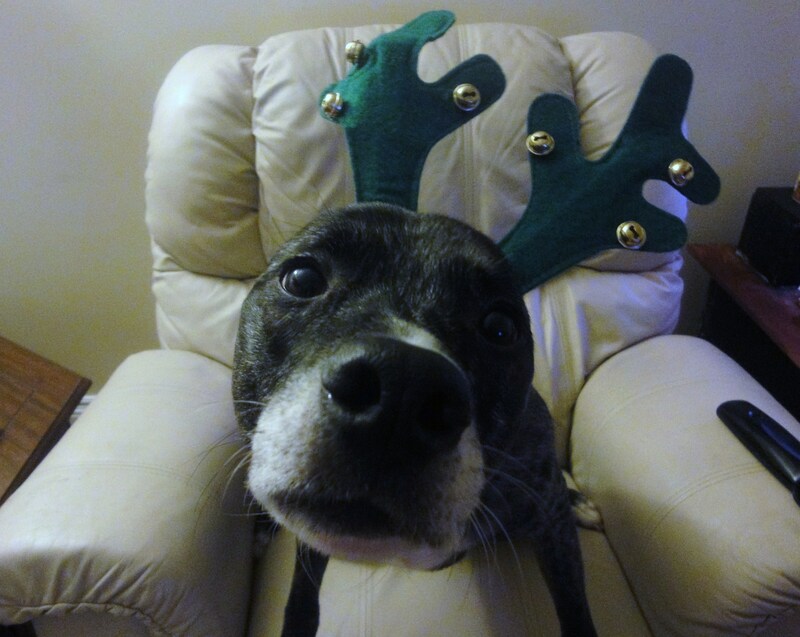 I shall bite The Typist if she tries to put antlers on me again this year. Maggie and Duke would look like they were going to cry if we put antlers on them, then they would destroy them! Shiva is so darn cute! I agree hands down, that we are the lucky one’s. We are the blessed ones and we definitely should be the grateful one’s..
Shiva, you do look silly in that holiday gear, but I guess Holidays are the season to be silly for all. 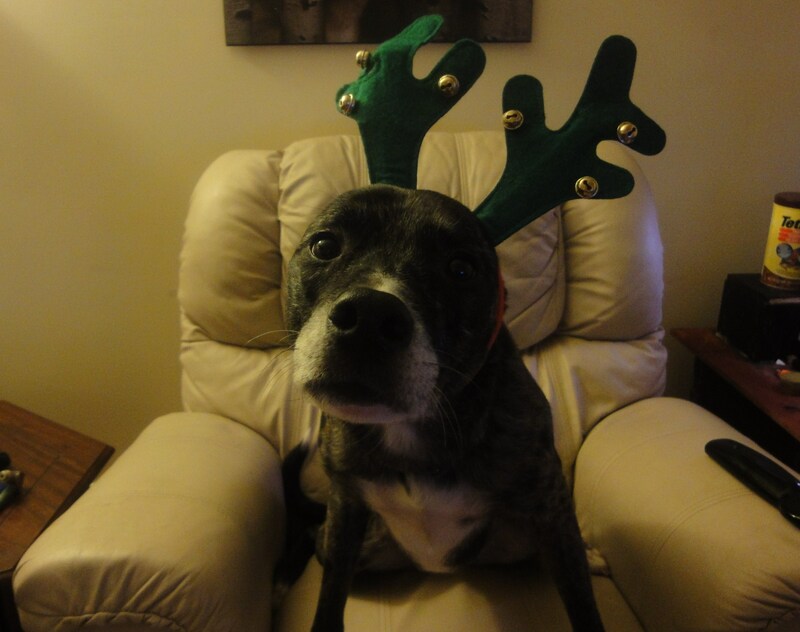 She is one adorable reindeer! LOL. I used to dress up my old Lab Luther, he was never impressed but he never complained. Tolerance, thy name is dog.